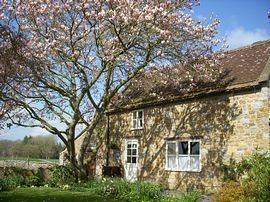 A relaxing holiday for families with children of all ages, or a retreat for couples wanting to escape city life! A luxurious stone cottage full of original features, with a large walled garden and a climbing frame, toys and a Wendy House. Feed the hens, collect the eggs, picnic by the River Brue. Swim in the outdoor heated swimming pool in summer, curl up by the fire in winter. 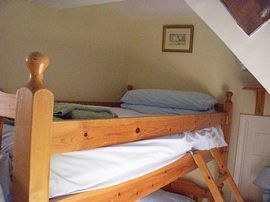 Double room and bunk room. Cot and highchair available. 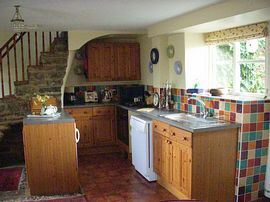 Fully equipped kitchen with microwave, dishwasher, freezer. Freeview TV with DVD and Video player. Washing machine and tumble dryer available. 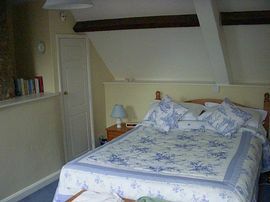 See our web site for full details and availability. Use these directions with a map especially if you are coming from the North or West. From A371 Wincanton to Shepton Mallet road, take the B3153 just before Castle Cary station. Clanville Manor is 3/4 mile along this road and the entrance is immediately past the railway bridge over the road at this point. £225.00 to £625.00 per week. 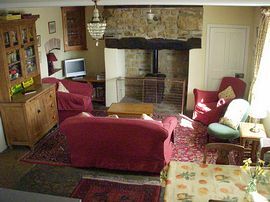 Short breaks available-see our website for details.